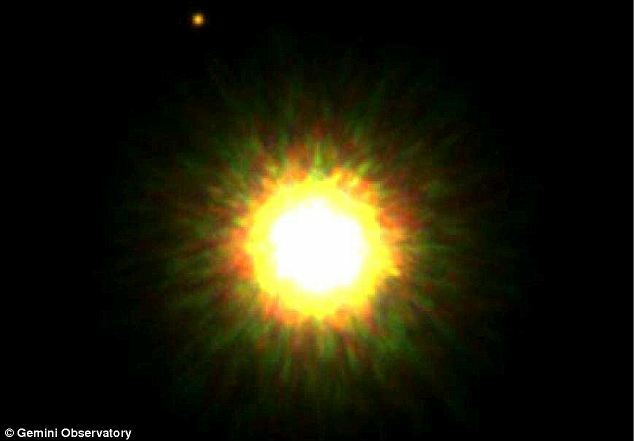 Astronomers have confirmed that an object in an image from 2008 — thought at the time to possibly be a direct image of a planet orbiting another star — is in fact a planet. I’ll explain in a sec, but I want people to understand that this discovery is being touted as the first direct image of a planet around another star. It isn’t. Nor is it the first direct image of a planet orbiting a sun-like star. What this is is the first direct image of a planet orbiting a sun-like star taken using a ground-based telescope. While that may sound overly picky, it’s actually a significant achievement, and worth noting. “Our new observations rule out this chance alignment possibility, and thus confirms that the planet and the star are related to each other,” says David Lafrenière of the University of Montreal and Center for Research in Astrophysics of Quebec. The team also took the planet’s spectrum, measuring its temperature and composition. Now that they know it really does orbit this star, Lafrenière retroactively claims firstie on an exoplanet spectrum. Other famous exoplanet photos have shown us blocked-out stars with fuzzy dots at their sides. This one shows the blazing star, too, putting in context that this is really a solar system. The planet is also special because it challenges planetary scientists’ best planet-formation theories. It’s far from its star, about 300 times farther than Jupiter is from the sun. It would take the planet roughly 1,000 years to complete one orbit. The host star, which has an estimated mass of about 85 percent that of our sun, is located approximately 500 light-years away in a group of young stars called the Upper Scorpius Association that formed about 5 million years ago. The planet has an estimated temperature of over 2,700 degrees Fahrenheit (about 1,500 degrees Celsius). This makes the planet much hotter than Jupiter, which has an atmospheric cloud-top temperature of approximately minus 166 degrees Fahrenheit (minus 110 degrees Celsius). The contraction of the planet under its own gravity during its formation quickly raised its temperature to thousands of degrees. But, once this contraction phase is over, the planet will slowly cool down by radiating infrared light. Within billions of years, the planet will eventually reach a temperature that is much more similar to that of Jupiter. According to Radar Online, Mel Gibson, anti-Semitic star of What Women Want, yelled racist garbage at the embattled mother of his child. Anyway, speaking of radar, guess what scientists located via telescope today? Alien planet! Alien planet, everyone! According to Space.com, designated non–Mel Gibson Internet safe haven, “[a] planet outside of our solar system, said to be the first ever directly photographed by telescopes on Earth, has been officially confirmed to be orbiting a sun-like star, according to follow-up observations.” The planet is around 2,700 degrees Farenheit, approximately the temperature in New York this past Monday. The Huffington Post reports that the planet is orbiting the star 1RXS 1609 and is part of a star cluster known as the Upper Scorpius Association. Now that you are more familiar with our new alien friend, let’s pick a name. We’ll humbly put forth the following for the consideration of the scientific community: Harold, Maisie, Mad Max, Jupiter II: 2 Fast 2 Furious, The Christ, and Planet Hollywood.